In 1992, "Lonesome Larry" focused a national spotlight on the plight of imperiled Northwest salmon. He was the sole survivor that year of the Snake River sockeye's astonishing migration to Redfish Lake in the Sawtooth Basin - almost 1,000 miles upstream from and more than 6,500 feet above the Pacific Ocean. The year before, in 1991, Idaho's sockeye had gained the dubious distinction as the nation's first salmon listed under the Endangered Species Act. These events renewed efforts to bring Idaho sockeye back from the edge of extinction. State and federal agencies established an emergency-room hatchery program that in the last several years has thankfully delivered Idaho's sockeye from single-digit annual returns to triple digits (and perhaps more this year) and has provided the fish some desperately needed breathing room. 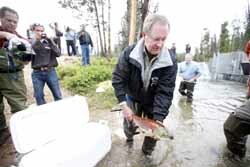 In fact, representatives from state and federal agencies gathered on the banks of Redfish Lake recently to celebrate this year's anticipated return of sockeye salmon. For the first time in decades, these fish were allowed to swim the last mile to their natal home, and namesake, Redfish Lake. While Sen. Mike Crapo, R-Idaho, properly acknowledged the strong role of fishing and conservation leaders in keeping the federal feet to the fire and ensuring more in-river protections for these fish, Steve Wright, administrator of Bonneville Power Administration, effused over this year's returns as evidence of a successful government effort to rescue Columbia/Snake salmon and steelhead from extinction. Without a doubt, this year's sockeye return to Central Idaho is a milestone and deserving of celebration. And it is a powerful testimony to the resilience and tenacity of a fish that we have pushed to the very edge. But it is essential that we truly understand the forces driving these returns in order to ensure a place for sockeye in Idaho's future. Contrary to the recent claims of the federal dam agencies, this year's return offers scant evidence of a working federal plan. Recent favorable spring flows, estuarine and ocean conditions and court-ordered spill over federal dams deserve the lion's share of the credit. Conditions for salmon survival in the Pacific Ocean vary by year and decade. The ocean is a fickle mistress. Fortunately, conditions during ocean residence of Columbia Basin salmon have been good in the most recent years, dramatically increasing salmon survival after seaward migration. The changing conditions at sea, however, are beyond our control. Not so with the river. Since 2006, at the urging of fishermen, scientists, tribes and conservationists, U.S. District Court Judge James Redden has required federal agencies - against their strong objections - to operate the dam complex a little more like a river by "spilling" water. This means fewer fish were barged past the dams and more actual in-river migrants reached the ocean safe and healthy. More fish safely to the ocean and more fish surviving in the ocean translate into more adults returning to the river to spawn. Of course, the sockeye hatchery program has also played a key role in this revival, but this "emergency room" approach by itself will never be a long-term strategy to restore healthy, self-sustaining, wild salmon populations. The dramatic increase in the number of smolts artificially produced and pumped into the river over the last decade masks a fundamental problem that still faces all Snake River salmon and steelhead: the lethality of downstream dams. Despite the increased returns, imperiled wild populations remain at serious risk of extinction. A warming Pacific Northwest climate exacerbates the risk. The arrival of sockeye in the Sawtooth Basin this year is indeed cause for celebration. But it also demands a clear-eyed assessment of how we got here and what we need as we go forward. An effective comprehensive strategy that protects and restores abundant, self-sustaining Snake River salmon and steelhead stocks requires far more than what the federal agencies and their current plan offer. There is no substitute for a healthy river, and that can only come from a president, an administration and a Congress with a renewed commitment to good science and a willingness to tackle challenging problems. That would truly be cause for celebration.